Baked vanilla and chocolate cheesecake on a chocolate flavoured digestive biscuit base topped with chocolate sauce. Baked for creaminess. Rich cream cheese blended with single cream on a crunchy biscuit base. 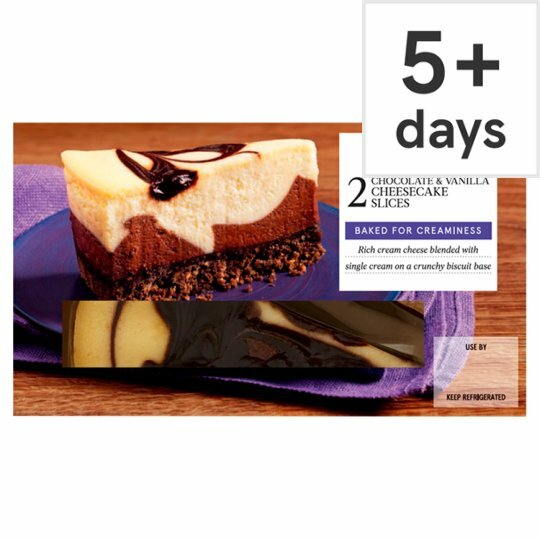 Our chefs were inspired by an authentic baked recipe to get a thick and creamy cheesecake. INGREDIENTS: Full Fat Soft Cheese (Milk) (21%), Single Cream (Milk), Sugar, Wheat Flour (Wheat Flour, Calcium Carbonate, Iron, Niacin, Thiamin), Margarine [Palm Oil, Rapeseed Oil, Water], Soured Cream (Milk), Pasteurised Egg, Palm Oil, Chocolate Sauce (2%) [Water, Sugar, Cocoa Beans, Cocoa Mass, Cornflour, Skimmed Milk, Gelling Agent (Pectin), Fat Reduced Cocoa Powder, Emulsifier (Soya Lecithins), Milk Sugar], Fat Reduced Cocoa Powder, Wholemeal Wheat Flour, Dark Chocolate [Cocoa Mass, Sugar, Cocoa Butter, Emulsifier (Soya Lecithins), Vanilla Extract], Cornflour, Rapeseed Oil, Invert Sugar Syrup, Emulsifier (Lactic Acid Esters of Mono- and Di-Glycerides of Fatty Acids), Raising Agent (Ammonium Bicarbonate), Flavouring, Stabilisers (Locust Bean Gum, Xanthan Gum).